Looking around Jackson County, Alabama, it seems they've designated and signed nearly every little road they can as a county highway. Even little dirt and gravel ones that are essentially driveways. Cullman County, AL has done the same thing too. Route 528 - A dinky one lane dirt road that has one house along it and an abandoned one at the end. You could pretty much definitely call this a driveway. Does anyone know of any other examples of really small county routes, or counties designating everything as a route? In case you weren't aware...in the Deep South, every public road that isn't a state highway or within a city/town falls under county jurisdiction. 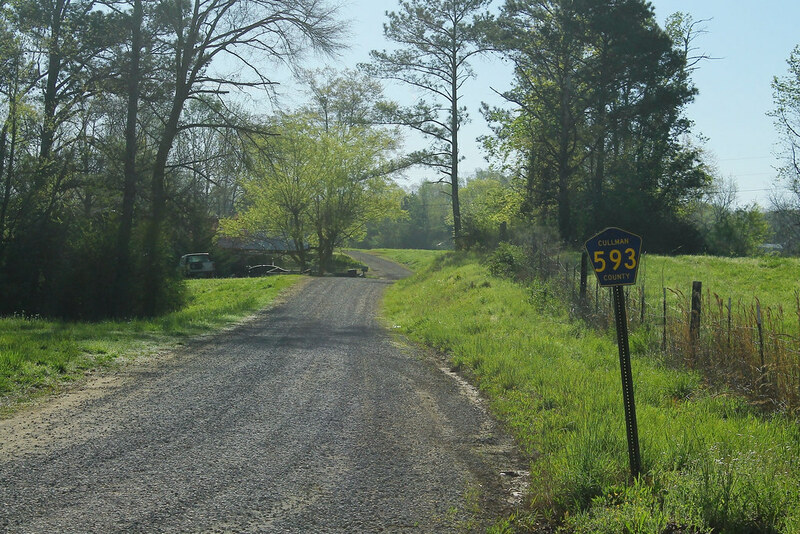 Several counties in Mississippi and Alabama give numbers to their county roads instead of names (you'll see the same thing in Clarke, Neshoba, and Lee Counties in Mississippi, amongst several others). I knew someone who lived on a minor road that the county considered private and didn't maintain. The residents looked through the records and found that it was a designated county road and had been forgotten. Presumably, in early times having public roads was seen as desirable for transportation and development, which is why so many were designated. We still do this, with undeveloped subdivisions having public road easements drawn into the plat. Whether the county ever builds an actual road usually depends on whether the area ever gets built-up, but nobody wants to buy land they can't legally drive to (at least by a cross country route). I know of multiple dead ends that are a result of a partial closure. Under state law, there are restrictions on closing a county road without another road to replace it. If someone owns the land on both sides for a long distance and wants to make it a private road, then closing it is easier. This leaves many dead ends that act as driveways for a single or multiple homes, but actually represent a contraction of the system, not an unnecessary expansion to act as a driveway. I think in relation to this topic, the history is an important part of understanding the map. They're great for getting 1285% of your daily requirement of shield numbers, but it does go a little overboard. Depending on jurisdiction, if they service more than one home, they wind up as some sort of "county road", but I think many are just there for wayfinding purposes; there are almost no street names nor street blades outside of the towns and cities. A good number of these little roads are actually paved; although the maintenance of them can literally be quite patchy, they're usually a squeeze for two vehicles to pass each other, and the shoulders are usually minimal. There's also some that aren't usable in a vehicle without some serious ground clearance and perhaps the ability to use four-wheel drive, if it's been raining. A good way to tell if they're okay for shortcuts or "taking the long way home" is what kind of vehicle is also cutting through, and how clean does it appear? In case you weren't aware...in the Deep South, every public road that isn't a state highway or within a city/town falls under county jurisdiction. I feel like that's true in most places (excluding stuff like National Forest Roads, etc.). Though I could be wrong I suppose. Though the difference is around where I've lived, all the roads are given traditional names, not route numbers. Though, you may have some local variance as to how it's handled. For example, Ada County Idaho (home to Boise, Meridian, etc.) 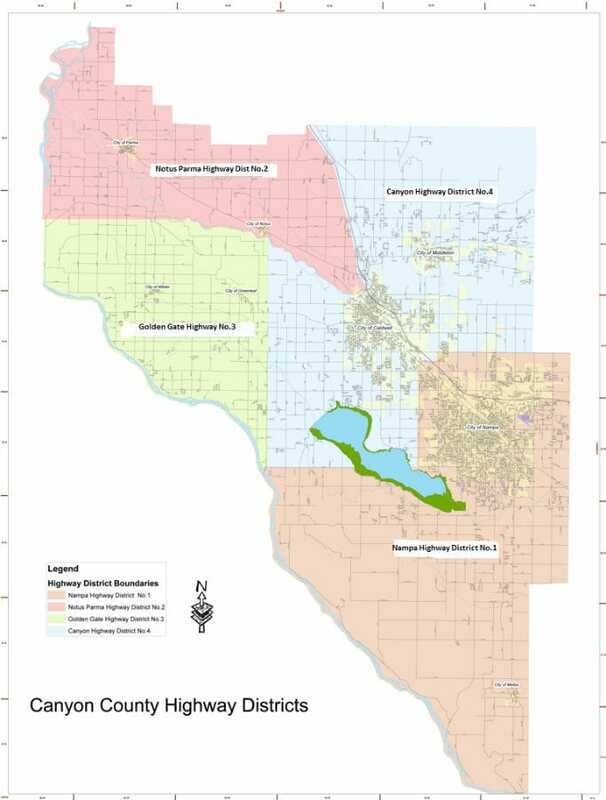 has one highway district, ACHD, which covers the whole county, including city limits. ITD remains in control of state highways of course (though ACHD actually handles the signals on them). So the individual cities do not have direct control of their roads here. So if I'm counting right, Canyon County has 12 different agencies in charge of the roads (plus ITD for state highways). EDIT: Then you have, probably the more common set-up, Deschutes County Oregon. The county directly maintains non-state/NF highways outside of the cities, rather than splitting it up into different districts that are not directly part of the county government. I feel like that's true in most places (excluding stuff like National Forest Roads, etc.). There are two distinct areas of the country where this is not the case: the Northeast (basically everything from Pennsylvania and New Jersey up), and the Upper Midwest out into the Plains (from Illinois and Wisconsin out to the Dakotas...not sure about Nebraska). These states all have a base unit of government that's lower than the county-level, and that includes local road maintenance and jurisdiction. Cook County, MN has some narrow, short, dead-end stub county roads like this where the purpose of the county road is basically just to connect MN 61 to some lakeshore homes. I believe in some counties in Wisconsin the county maintains every road in an unincorporated area even the ones that aren't officially signed as county routes. I know this is at least true for Ozaukee County. I don't think it's quite that bad here in Louisiana, but I have seen while traveling some parishes that still use those blue county (parish) shields for nearly every road not labeled an US, I, or state highway. In my home parish of St. Landry Parish, though, they never used those shields; they originally named their local roads as numbers via wards (for example: Parish Road 1-22 in Ward 1 which surrounded Opelousas); and ID'd them with blades. When the parish went over to the 911 system for emergency/first provider service, they killed the ward system, and mandated that all the roads be converted to names with numbers signifying their "block" numbers. 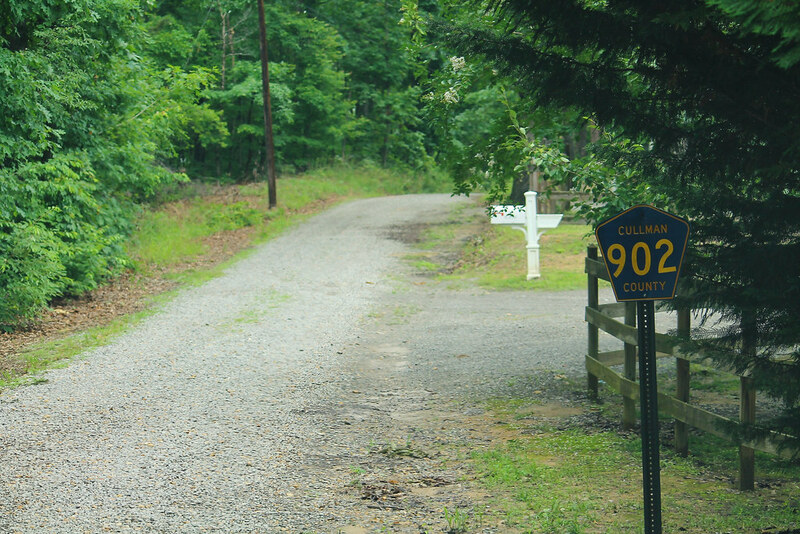 The private roads are now delineated with blue blades to distinguish them from the public roads (standard green), and usually are named by the property owner whence they pass through. I'm sure there are more than a few dead end roads out there, but at least they don't carry numbers. Texas has quite a few county roads that don't go anywhere and only serve a few houses before dead-ending. Most counties just number them and I've never seen a shield for a county road. In the late 90s I saw my first-ever county road shield in Texas, somewhere between Nacogdoches and I-20. During road construction on I-35 somewhere between Von Ormy and Pearsall back around 2011 or so, I once saw a county road signed on a BGS with a white rectangle—just like an FM road, except with the work COUNTY at the top instead. I wish I had snapped a photo, because I've been unable to figure out exactly where that was.